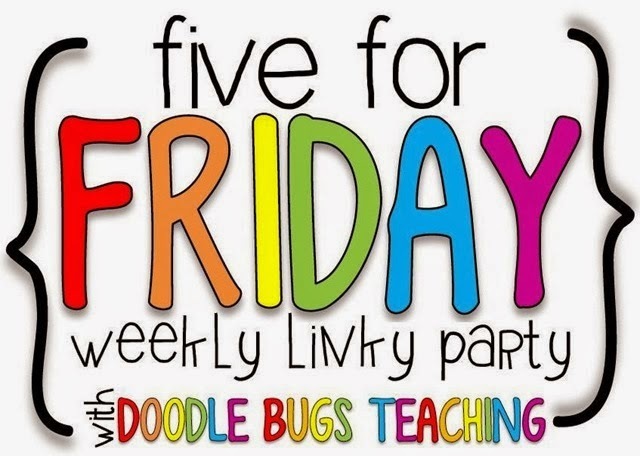 Five for Friday... er... let's just say Five! Thanks Kacey at Doodle Bugs for my fav linky. 1. Do you know about Super Magnet Man? No, he's not a superhero... well, at least not in the typical sense. But he does sell a SUPER selection of SUPER good magnets. I mean ALL sorts of magnets. Ball magnets, disc magnets, rubber coated magnets, even magnetic jewelry. 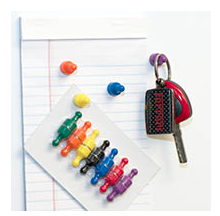 The ones I use the most are the magnet hooks and pegs which are great on the whiteboard. They are high quality and really strong. BEST of all they are a GREAT price– better than I've seen in most stores, if you can even find them in stores. Some are just a few bucks for a set. The site even has little videos of him explaining about some of the magnets. He'll be your superhero, too. Clicking on the pics above will take you to the educational magnet page on the site, but click around to see all the different types of magnets when you get there. He's my first stop when I need magnets. 2. Spring means COLOR... well, at least, it should mean color, right? We just can't seem to shake these very cold temps as it is in the twenties as I write today. Consequently we aren't seeing much spring bloom yet, though I did notice yesterday that the tops of my tulips are showing. 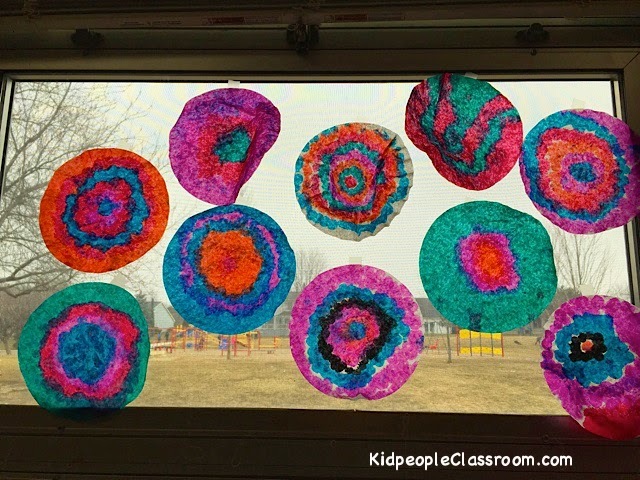 To bring color inside the classroom we did our bingo dabber coffee filter window art. Super easy, super colorful. I gave all the kids a tray to contain the paint that comes through- it rinses right off afterward- and they went to town. They are especially bright on the window, even if there isn't much sun shining outside. Click on the photo above to see five different things I did with these in a previous post. 3. 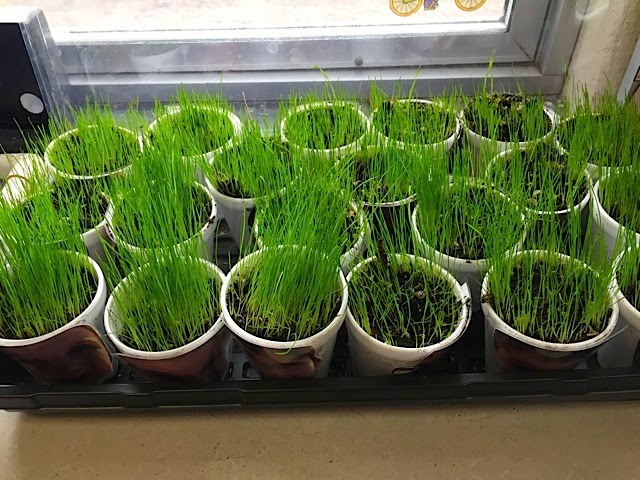 I am bound and determined to see green grass! Here is another way we bring in spring. This is just a preview– I'll show you the ins and outs, and dos and don'ts of this project next week as I'm learning along the way. 4. We are reading Elephant and Piggie books right now. Most of you know about this series of books by Mo Willems. 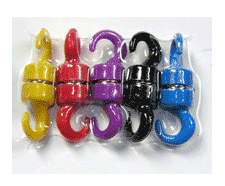 They are ideal for the K-1 set for many reasons. I wait until this point in the year to bring them out so my kidpeople know a good bank of sight words. I put out two bins of just these books– yes, I have invested heavily, and the school library helps– and I have the kids pair up to read them. I pair kids because E&P humor is meant to be shared, and if kids are paired, then between the two of them EVERY child truly can read the words. It's great fun to see each take on the elephant or piggie voice, which these books with their word balloon, dialogue style are so perfect for. The kid partners usually read each book at least twice so they each get a chance to be both characters. These books give us weeks of DEAR time. There is a lot of teaching that you can do with these two funny characters. I especially like how the kids have to pay extra attention to the subtleties of emotions in the illustrations. We had a great discussion exploring the feelings of pride, generosity, jealousy, anger, rage, embarrassment, sheepishness, righteousness, forgiveness, and friendship– and that was just with ONE of the titles! 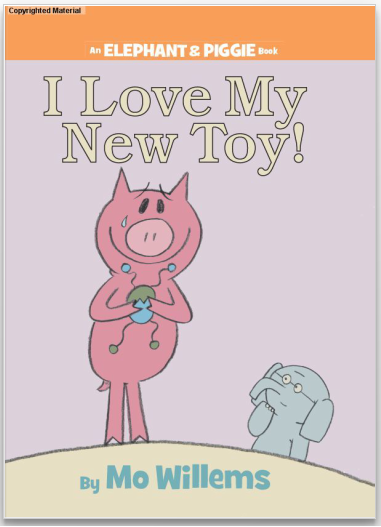 I Love My New Toy was an eye opening book for many of my little people, and this year in particular it seemed many neither noticed the subtly of feelings and intentions, nor had the words to label the emotions when I pointed them out. Who would think such a simple book could bring about so much learning. Brilliant! Click on the cover above to go to teacher guides for Elephant and Piggie books. 5. Now I've saved the best for last! This Sunday I am participating in an absolutely terrific linky and giveaway. 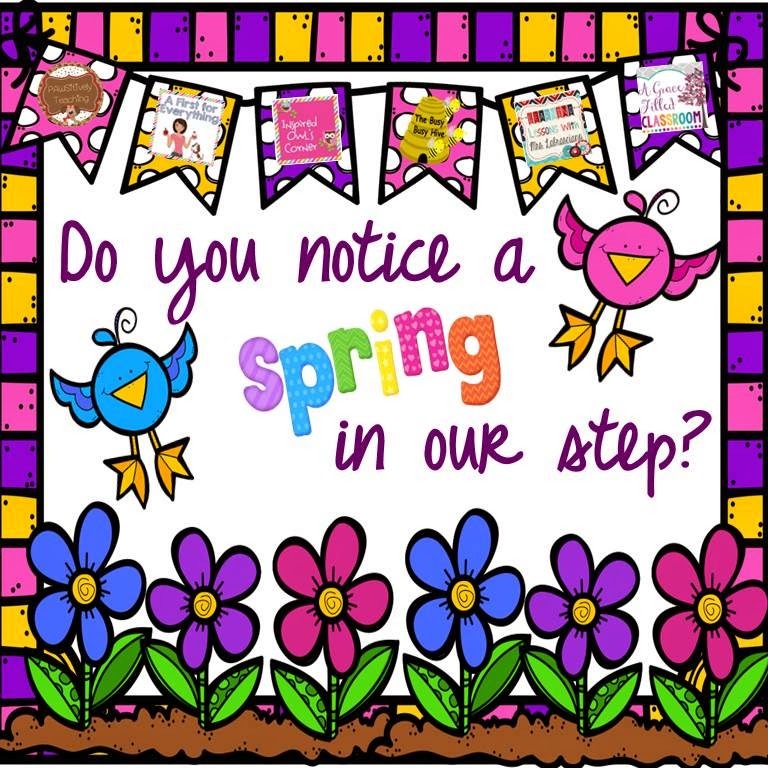 A big bunch of bloggy friends are getting together to share happy spring thoughts... and milestone events, and discounts, and freebies, and a big GIVEAWAY! Wanna do a little shopping?? Please, please, please come back tomorrow! I have a huge discount and a fun freebie just for stopping by! NOW, click on back to Doodle Bugs. I am!